FLESH AND WOOD ACOUSTIC TOUR 2015! 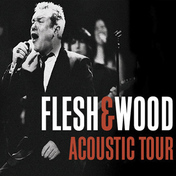 The Flesh and Wood Acoustic Tour 2015 will feature Jimmy and a nine-piece band, augmented by a luscious string section, performing songs from the Flesh and Wood album as well as some of his biggest hits and favourite songs as you’ve never heard them before, using only acoustic instruments but still with Jimmy’s trademark rock ‘n roll swagger. Jimmy and the band will perform the full, over 2-hour show (two sets). “Last year’s regional Flesh and Wood shows on the 30:30 tour were almost as much fun as recording the album in the first place and it’s great that we’ll get to bring the show to the Gold Coast too. The band and I are looking forward to playing all these great songs again, with a bit of storytelling and strings thrown in, when we take the show around the country in July”, said Jimmy. In 1993, Jimmy Barnes gathered a few friends to help record his seventh album, Flesh and Wood, which included duets with some legendary Australian and international artists, including Diesel, Archie Roach, Ross Wilson, Tommy Emmanuel, Don Walker, Deborah Conway, The Badloves and the late, great Joe Cocker. The album featured many of Jimmy’s, and Cold Chisel’s, hits as well as some well-known covers, and was recorded fully acoustically. Barnes’ latest album, 30:30 Hindsight, debuted at No. 1 on the ARIA Album Chart, giving him his 10th solo No. 1 album, and reaffirmed his title as the Australian artist with the most No. 1 albums of his career with a total of 14 (4 with Cold Chisel). Throughout his 30-year solo career, Jimmy Barnes has sold over 6 million albums and performed to almost as many concertgoers, continuing to pick up new generations of fans along the way. Tickets to Flesh and Wood Acoustic Tour 2015 at Jupiter’s on the Gold Coast will go on sale at 9.00am on Monday, 4 May 2015, and are expected to sell FAST! For details of the Frontier Members Pre Sale for the Gold Coast show, go to www.frontiertouring.com.au/jimmybarnes.